With thousands of websites online requiring stock photography and illustrations (and people starting to wise up to the fact that just taking other people's images and using them on your own website isn't good practice) stock photography and illustration sites like istockphoto, ShutterStock, graphicleftovers and Pond5 can help you sell the same images of your art over and over again. These sites actually are a little like owning a print on demand store except you don't need to put your art onto products. People just search for images for their own sites and buy them at the required image resolution they need. To be successful with stock image sites it helps if your art is in line with popular themes or current events (i.e. the things that a lot of people will be looking to find images for). Research each site and see if you can tell if your art is likely to find a niche place within them. The more success you have the more likely it is people will start to ask you questions about how you achieved that success. Success brings credibility. Credibility means that not only will people take your advice seriously, they may even pay to learn what you know about how to become successful. Any knowledge you have can be turned into an online tutorial or series of tutorials. 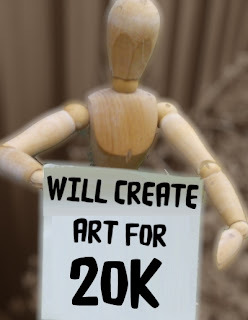 Whether it be a tutorial on how you create your art, to a tutorial on how you made your first $1000 dollars online. People will pay for that knowledge. Just like your local artist group will pay to attend workshops on how to improve their art skills, people online will do the same thing if they think you have the knowledge to teach them. Online video courses are very popular but if getting in front of a camera isn't your thing you could create an illustrated, written, step by step guide as a website or ebook to sell. Sites like Udemy give you a market place to sell your courses in, which is useful, both for the market and to see if there is demand for any course you intend to create. If you have a website that is getting a significant amount of monthly traffic that can be very attractive to advertisers. You may like to set aside space advertisers can hire for a set price and period. Make sure the advertisers you choose are relevant to your audience. If you don't want the hassle of managing ads yourself, another option is to use Google Adsense (which pays far less but is a kind of set and forget option if you don't want to manage advertising yourself). Adsense will place ads on your site targeted to your audience based on the content of your web pages. You receive varying amounts of revenue per ad based on clicks. It's likely that you won't earn a lot of money through Adsense initially but it can be worthwhile once your site starts to get high volume traffic. Just be aware that any advertising you place on your sites, that include links, is an invitation for your visitors to click away from your site. Sponsorships can be in the form of, but not limited to, money for advertising placements, products for review or promotion of events. Once you develop any kind of significant audience you may find companies approaching you to feature their products for reviews etc. It can be a bit of a mine field. Generally, if you do accept sponsorship deals, try to make sure the sponsor is a good fit for your art. You can also approach sponsors and pitch ideas to them for potential sponsorship arrangements that might be mutually beneficial. There's no harm in trying. No one will ever tell you 'yes' if you never ask in the first place. If you are writing a blog about your art and getting a fair amount of site traffic as a result there are plenty of blog companies out looking for the opportunity to pay you to write blog posts about their products and services. Just make sure your paid posts are a good fit for the rest of your content. Paid blog post writing can be a full time career. Not only can you get paid to write posts on your own blog but companies may even pay you to write articles for their blogs as guest posts or even as a regular writer. As mentioned there are many more ways to make money from your art online. Personally I make Animated Explainer Videos entirely online and make a fairly decent living from it. No one way is going to be enough to earn a full time wage when you first start out. However if you pick two or three and focus on building them up so they earn a portion of your total income it's certainly possible to make a living from your art. 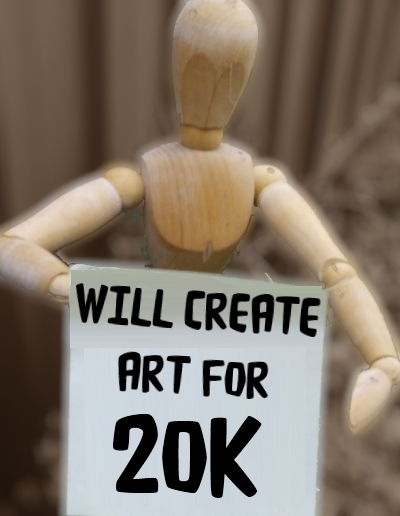 Next post I'll look at the very important (and most often asked) question of how to price your art?